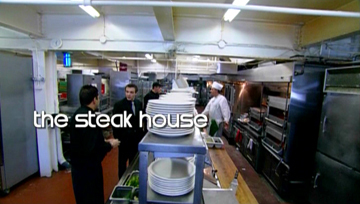 The Steak House, besides being the title and the setting for the second episode of What's That About? I wrote, was the actual location where I first met the producer of the show. That was prior to my getting hired on to write for the series. I met the producer, and the rest of the people who mattered in the company, over a free steak lunch, which I was too nervous to finish. But the "scouting report" I wrote for them afterwards was what actually got me the gig! After lunch, my job was to go backstage and see the setup, the various machines, and the jobs people did. Then I went home and wrote about them in an exciting way, so that the people in charge and the network would know they had enough material for an exciting episode. They liked my style, so they tried me out. I actually didn't meet the head chef featured in the program. He started work after I had made my visit. Still, as with the walk around the scrap yard, being able to see the kitchen and the giant freezers first-hand gave me all sorts of ideas of interesting things to feature in the show. The main thing we were doing, was to follow the process of making a steak dinner from the delivery from the warehouse to your plate. For this show, we didn't go back further than that: "Where do steaks come from, Daddy?" "From the warehouse, son!" Then it was a simple matter to go through the cutting room (meeting the butcher, and getting a demo of the different cuts of meat, which the 3-D animators did with this cool, wooden chest-of-drawers cow. A drawer on a section of the cow would open up, and out would pop pictures of roasts or briskets, or whatever). Then the show would go into the kitchen to see the processes there, and finally out into the restaurant proper. One proviso, however: this was a science show, and not the cooking channel! 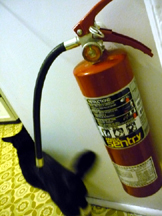 So we had to stick to things scientific.